You’ll love this BEACHFRONT condo and its breathtaking views of the Gulf of Mexico! Directly on the beach, the soft, white sand is just steps from your door! This 2 bedroom, 2 bath, top floor unit will comfortably accommodate up to 6 people. Brand NEW memory foam king size mattress (May 2018). It has a full size kitchen, and a large laundry room. It is fully appointed and offers you all of your comforts of home. Its cheerful tropical décor will refresh your spirit. Enjoy the beautiful view from the kitchen, dining room. Living room and master bedroom. The large balcony is the length of the living room and master bedroom and overlooks the beach. Watch the dolphins play, enjoy the view of the sparkling water and the relaxing sound of the surf. Here you will take in the most magnificent sunsets. Fully stocked with board games, puzzles, videos and beach toys for family fun and enjoyment. Full laundry room in the condo for your convenience. Ideally located is within walking distance to the famous Pier 60 where you’ll find a fishing pier, playground, and a variety of artists, crafters, street performers, and concerts. Fishing charters, dinner cruises, dolphin watching excursions, fine dining, shopping and nightly entertainment are also a short walk from here. We are about 1-1/miles from the Clearwater Aquarium, the home of Winter the Dolphin! We are only 35 minutes from Busch Gardens, and one and one-half hours to Orlando. 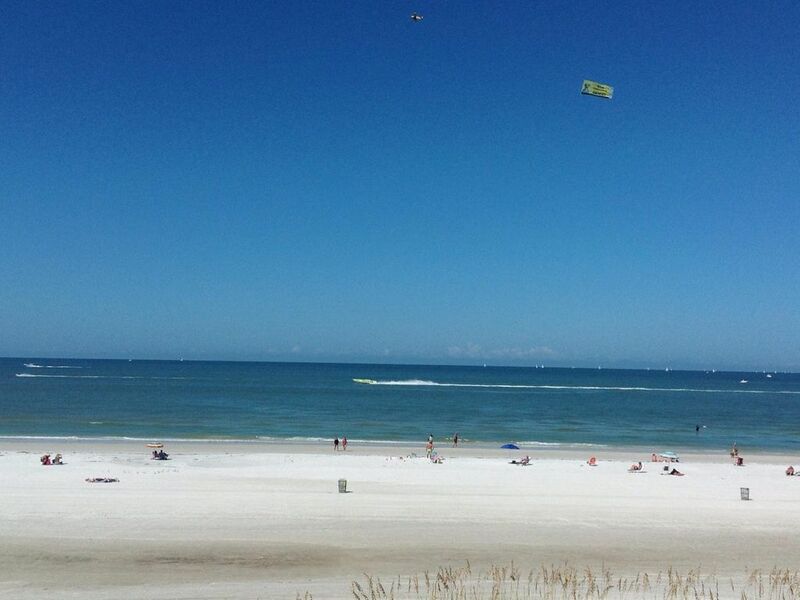 See the beach and beautiful Gulf of Mexico from just about all of the rooms. We just returned from spending a week at Kelly's condo. We had a great time. The condo is beautiful and has everything you need. The location is right on the beach. We watched the dolphins from our balcony. Restaurants and The Pier are within walking distance. So glad we rented this and would definitely rent this condo again!! Great location! We loved the condo and the views. Super cute decor and well appointed with everything we needed for our comfort inside and outside on the beach. Thanks for having the little things like paper products, condiments, soaps, beach towels, etc. If our next visit is to Clearwater beach, we would book this condo again. Owner was readily available to answer questions during our stay. I only wish I could have recycled all of our bottles and plastics. There was no where to do so on the property. Great location, Sunsets were amazing all 7 days. Kelly has everything you could need right there. This is a great little beach house. It's not the Hilton but who wants that when you can have a beach front condo, free parking and the best sunset in Clearwater right in your own back yard. Kelly has thought of everything from coolers to beach chairs and umbrellas. It's all there. You wont be disappointed. We loved it. Breathtaking view, close to tons of restaurants, and the Condo has everything we needed! My Wife, Daughter, and I needed to re-charge the batteries for a few days. Kelly’s Condo was exactly what the doctor asked for. You can’t find a better view. The sound of the waves are extremely relaxing. We plan to come back soon! Thank you Kelly for a wonderful vacation!